While Nitish Kumar’s performance as chief minister meets with almost universal acclaim, voters don’t see him having a lot at stake in the Lok Sabha polls. PATNA: Bihar's voters seem to be a conflicted lot. Yes, Nitish Kumar has done well as chief minister, they acknowledge. But against that, they feel the need to support Narendra Modi's campaign to become the country's next prime minister. With many looking to make a distinction between how they vote for state and centre, there seems to be something of a wave in favour of the BJP and its prime ministerial candidate in Bihar. This could mean Kumar's JD(U) taking a hit in the elections to the state's 40 Lok Sabha seats. "What Nitishji has done for Bihar can't be forgotten. But we want Narendra Modi at the helm of affairs at the Centre," said Keshto Tanti of Kaban village in the Jamui (SC) constituency. "Of course, when his (Kumar's) time will come in the state assembly elections, we will back him with full force. We want him here as the chief minister for at least 10 more years. There is currently no other leader better suited for the top job than Kumar." Tanti belongs to the EBC or extremely backward caste category, which like the Mahadalits constitute Kumar's silent support base. His fellow villager Subodh Thakur, again of the EBC, also spoke highly of the chief minister but said he was supporting Modi for the PM's post. Pochu Razak, a Mahadalit of the adjoining Nabinagar village, affirmed his loyalty for Kumar saying he had done a commendable job but predicted a split in the EBC votebank. "There is a buzz in the name of Narendra Modi and the EBC vote of my village may have split this time," Razak said. The chief minister may still be able to count on the goodwill of the upper castes, although they could be upset with Kumar for his decision to split with the BJP. But their voting behaviour may be largely influenced by the Modi factor. "Nitishji has done good work but the Brahmins of my village will vote for Modiji this time," said Ratneshwar Jha of Brahmin-dominated Markanda village in Darbhanga Lok Sabha constituency. "We are looking at the Centre this time around and the Brahmins especially are rooting for Narendra Modi." In the case of Muslims, support for Kumar could be weakened because many of them regard the RJD and Congress as better equipped to counter the BJP and will opt for tactical voting on these lines, although they too praised the chief minister's development focus. "It is not clear which way the Muslims will vote. But I guess the majority vote will go to the RJD-backed Congress candidate Ranjita Ranjan," said Tauhid Alam, 55, who runs a textile store at Simrahi Bazar near NH 57 in Supaul Lok Sabha constituency. "But it is not a vote against Nitish Kumar who I admit has been able to script a turnaround story in Bihar. We are voting for Congress because it has the political wherewithal to stop Modi from forming the government." Kumar may not have been able to convince enough people that much hangs in the balance for him in the Lok Sabha election. 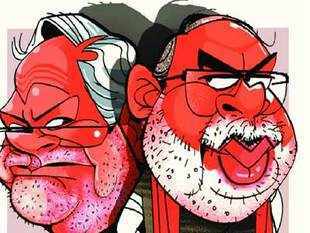 "Nitishji has no stakes in this election but we will back him in the state assembly elections to the hilt," Alam said. To be sure, the Muslim vote could still go either way, depending on the winnability of the RJD or JD(U) nominees.